Approximately 3.9 million dogs enter animal shelters nationwide each year and approximately 1.4 million of them are adopted. Of the adopted dogs, return rates to the shelter can be as high as 20% with the primary reason being behavior problems. Owners are frequently ill-matched with dogs and puppies when adopting from a shelter and are likely to return the dog. The project’s main challenges are around trustworthiness and reliability. 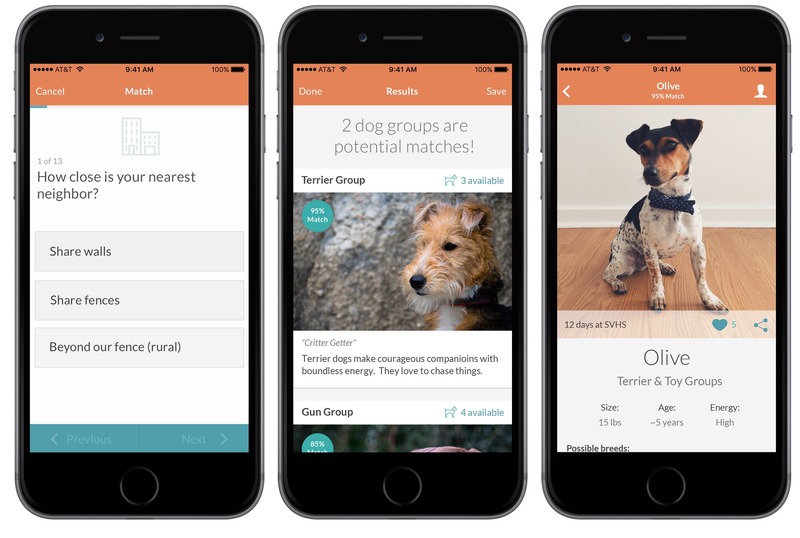 The app needs to be trustworthy so that the shelter can feel confident in using it for dog adoptions and it needs to be reliable and accurate to match correctly. Extended beta testing periods would be necessary and marketing strategies would need to be explored regarding sales to shelters and individuals. 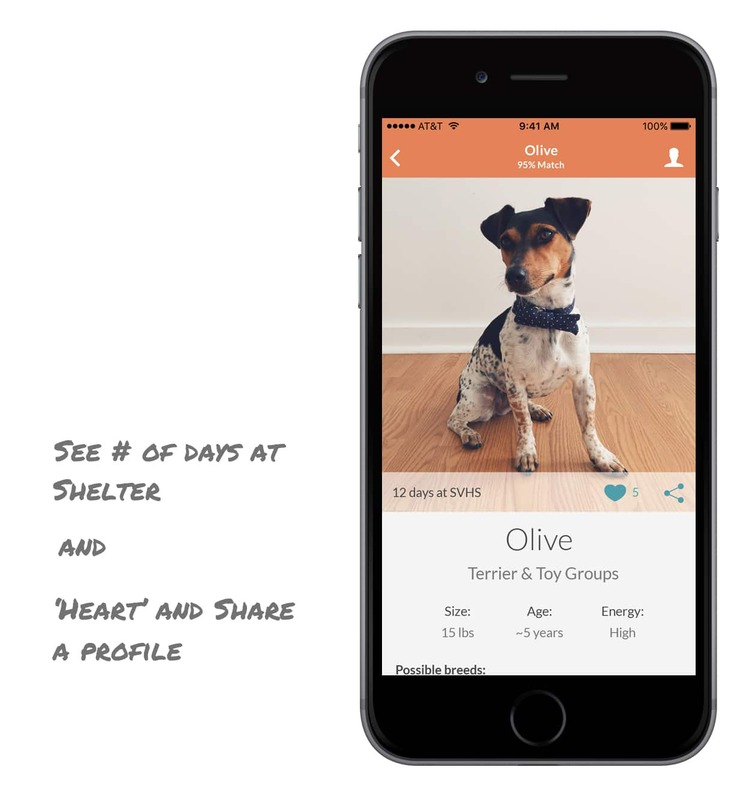 The main goal of the app is to increase successful shelter adoptions by decreasing the number of returned dogs. For the business, we want to provide a reliable service that is marketable for shelters and the general public. For users, the app should provide a reliable match and details for adoption and further information. The individuals that support shelters in adopting dogs have a strong desire to alleviate the problems associated with shelter adoptions. Volunteers that make it into an adoption role have good customer service skills, significant experience with the shelter, and close interaction with the dogs. Giving these users an app that is engaging, easy to use, and trustworthy is crucial. These would be the experiences that influence business decisions to commit to taking the app on shelter-wide. Once our prototype is developed, we will beta test the app in the pilot shelter programs that my client runs. Adoptions that are made via the app will be tracked for amount of returns and overall success. Our goal is to decrease dog returns by 50%. We also hope to increase owner accountability and awareness regarding their dog choices. Shelters should see an increase in their contact base which will provide expanded marketing opportunities. My main design goal was to create a solution that worked for both shelter employees and the general public. I wanted to provide information in a way that feels trustworthy and an experience in browsing profiles that is familiar and engaging. I focused on the main use case of a volunteer using the app at an adoption event because it highlights the need for a mobile app and is easily translated to the general public use case. I researched dog adoption apps, primarily mobile but also a few desktop apps. 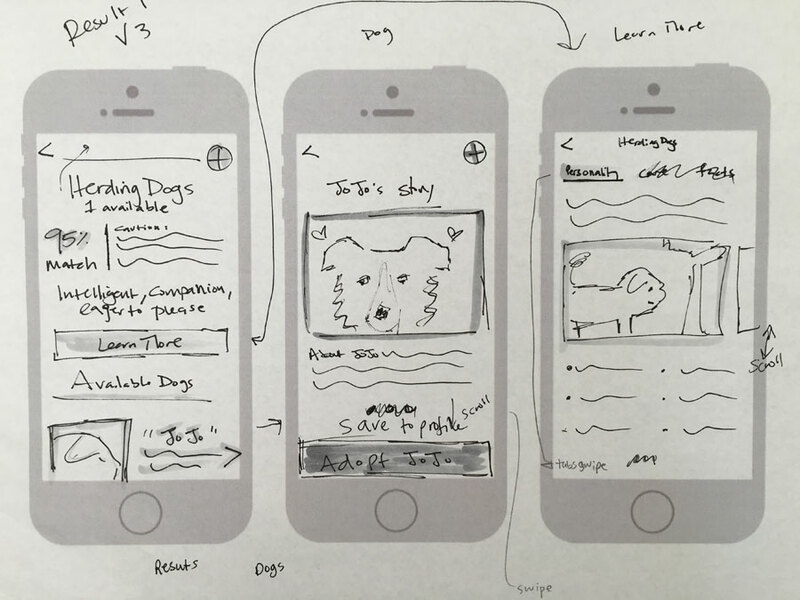 I took notes on their user flows, dog profile content, visual styles, and overall tone. How did they present dog profiles and what might increase adoptions via emotional drives? I knew our content would have a competitive advantage, but I needed to ensure our presentation would as well. I also took inspiration from photography and profile browsing apps. 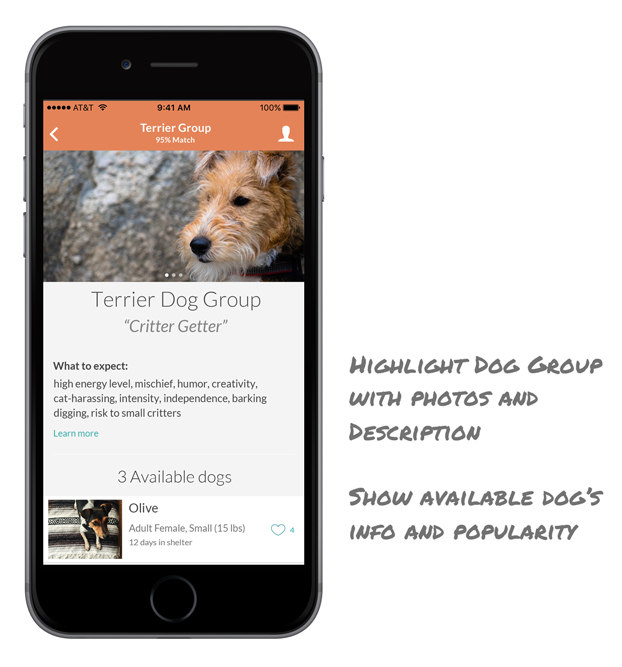 The mobile flow should support the ability to quickly match to the dog groups and easily create new customer profiles along the way. When customer profiles are created valuable contact information is gathered and stored. 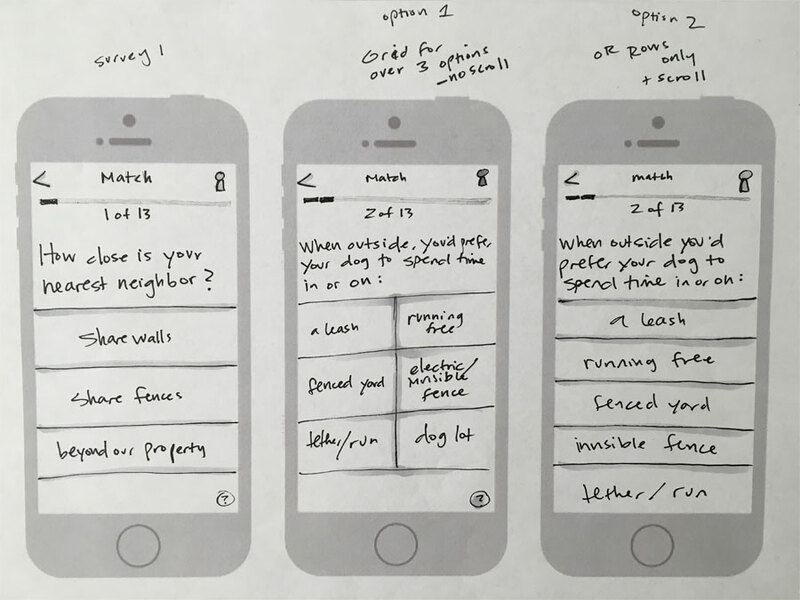 Once the main flow was developed I sketched several main screens to explore interaction, layout, and presentation. From the home screen a user could choose to match a dog to a person’s lifestyle or identify a dog based on it’s physical characteristics. The survey would take them to their results page with dog group recommendations and available dog profiles. I wanted to ensure that user’s of the app would be impressed by the quality of photography, so sourcing from a professional photographer was required. The results screen would highlight characteristics and photos of the dog group and a list of available dogs. To support the emotional motivations of prospective owners, I added in the ability to ‘heart’ or favorite a dog, share a profile, and the length of time the dog had been at the shelter. The group profile gives a snapshot description and photos to scroll through. They also list the available dogs that a user can favorite immediately or view to get more information. The dog profile shows off a great photo and gives relevant information and a short history. A user can get more information on adoption, favorite, share, or move straight to adoption. 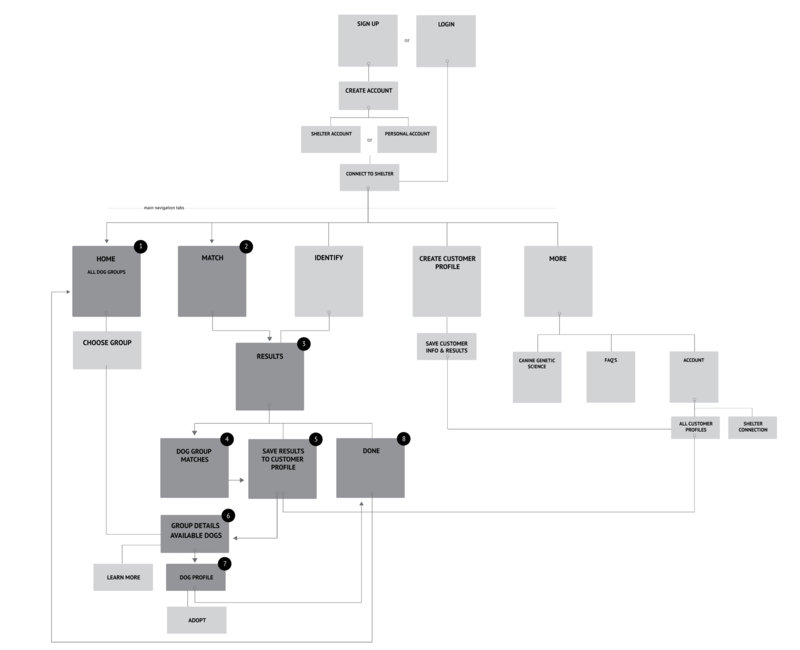 I’ve created a prototype of the main flow that my client and I will use to plan our next steps. The prototype shows a user taking an abbreviated match survey and choosing a dog profile to view. Perfect Match is a reimagining of our previous web app with new features added. We will likely redesign our web app based on this prototype and look into putting the mobile app on the roadmap. The beta period with our desktop app has been successful, so we are exited about further growth and potential success with a mobile app. This project has given me a chance to revisit an old project and dive deeper into mobile app design. I was able to concept new flows and use cases for the app that I think could add a competitive edge to my client’s product. I made the move to Sketch from Adobe during this project and used Marvel for creating the first prototype. 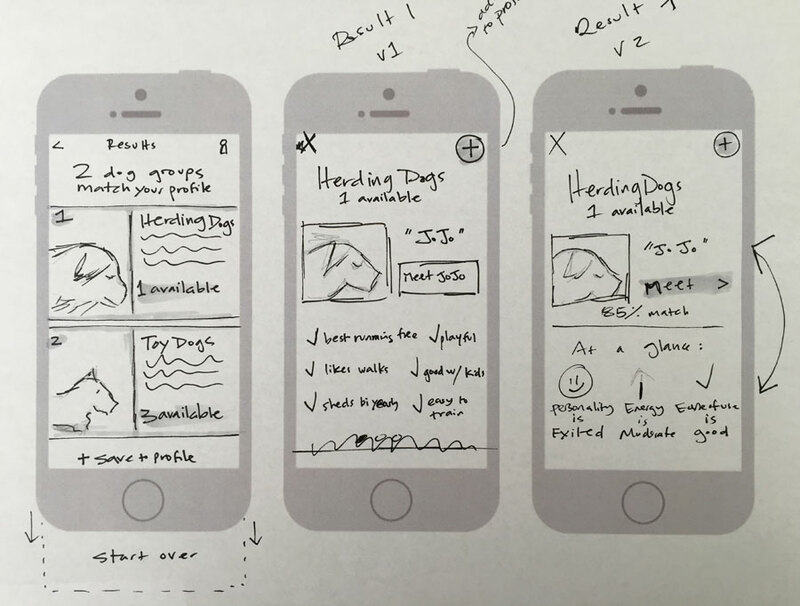 I’d like to create a more interactive prototype with Flinto or Framer next to show my client behaviors and micro-interactions we can add to the flow.